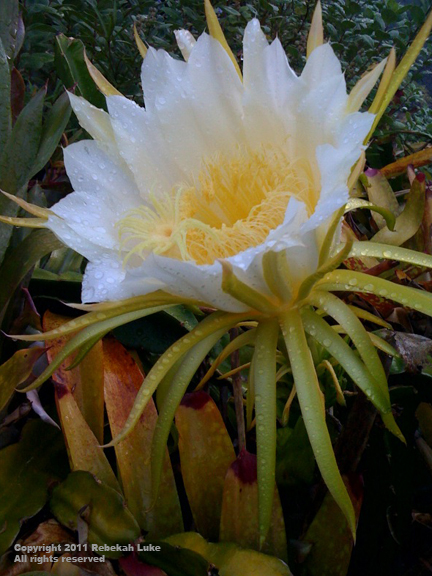 For the second night in a row I remembered to go into the front garden to view the night blooming cereus. Each bud opens up for one night only and will start closing at dawn. Tonight’s bloom is the largest of mine to date. I figured out that trimming encourages blooms and controls willy-nilly spreading. A layer of pohaku (rock) in a free form shape on the ground tells me where to trim so that the cereus is confined to a definite area. Gosh, after tonight I’ll have to wait until next August to see the next bloom of these beautiful flowers. A treat for us this morning at the studio! Two cereus! 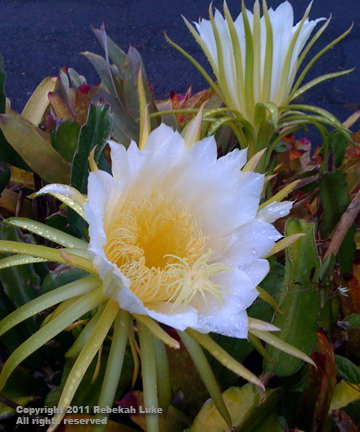 Night blooming cereus, that is. You can probably expect to see me post images of these cactus flowers every season. They’re so dramatic, blooming only at night for one night only and closing at sun up. I sometimes paint them. Here they’re mixed in with some bromeliads.